A exposição de David Bowie, que estava em Londres, veio recentemente para o Martin Gropius Bau (convém comprar os bilhetes na internet). Not only was Berlin the place where the British musician, singer, producer, actor and painter David Bowie conceived and recorded what is probably his most famous song but it is also most certainly about Berlin: he sings of a couple in the shadow of the Wall, shots above their heads, and the desire to swim away like a dolphin. David Bowie is one of the most influential pop artists in contemporary music history. His multi-faceted body of work has marked milestones in the history of pop, inspiring bands and musicians since 40 years to the present day. With the three albums produced by Brian Eno – “Low”, “Heroes” (both in 1977) and “Lodger” (1979) – Bowie shifted the aesthetic borders of pop music in the late ’70s from his base in Berlin. 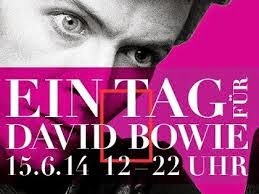 On the occasion of the Bowie exhibition that runs from 20 May to 10 August 2014 in the Martin-Gropius-Bau, the Berliner Festspiele, in cooperation with ZEIT-Stiftung Ebelin und Gerd Bucerius and Musicboard Berlin, are organising “One Day for … David Bowie” to explore the glamorous Bowie universe from a Berlin perspective. In an evening gala, ten Berlin bands will pay tribute to Bowie by playing cover versions of his songs, while the crew from Kaffee Burger’s “Berlin bows down to Bowie” will stage a Bowie show in the afternoon run-up to this event. The “Day for … David Bowie” begins around lunchtime with a diverse programme of events: after Bowie walking tours around Potsdamer Platz, the Haus der Berliner Festspiele will be enlivened with lectures, film screenings, a fashion show by participants in the school workshop “MGB Impuls²” from the Martin-Gropius-Bau and a video lounge; meanwhile, Diamond Kooks will be concocting Bowie’s favourite culinary dishes in the summer garden. Those who appear as Bowie lookalikes in front of the Haus der Berliner Festspiele can win free tickets to the day’s events. And anyone who uploads a cover version of his or her favourite Bowie song has a chance of being presented during the gala. Costumava ser um dos meus heróis.